Belladonna is a 16 month old Mastiff. Bella is a rescue shelter dog. She captured my heart. She likes to chew tractor tires! Bella had a very bad start in life. Here in the country, she has all the love and care that can be given. After all, doesn't she deserve it. Bella is a beautiful girl. Thank you for rescuing her and giving her the life, yes, she does deserve. I have a rescue lab/chow and love him dearly. I would never get a dog from anywhere but a shelter or rescue. Aww, what a sweet girl! 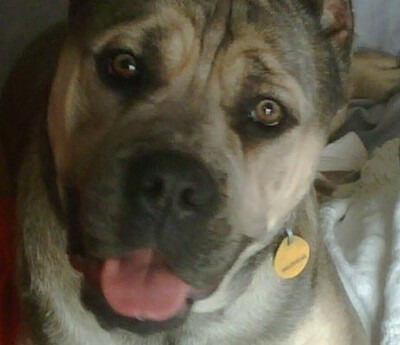 My niece had a mastiff and her name was Ruby, she was the best and loved everyone. Ruby had her own love seat in the living room, so cute. Ruby has crossed the Rainbow Bridge but there is a beautiful picture of her hanging in the office. I am so glad you found Bella and she found you! She is a big beautiful Teddy Bear. We have a rescue Rhodesian Ridgeback and love him so much. He touched my heart the minute I saw him. What beautiful, expressive eyes she has!